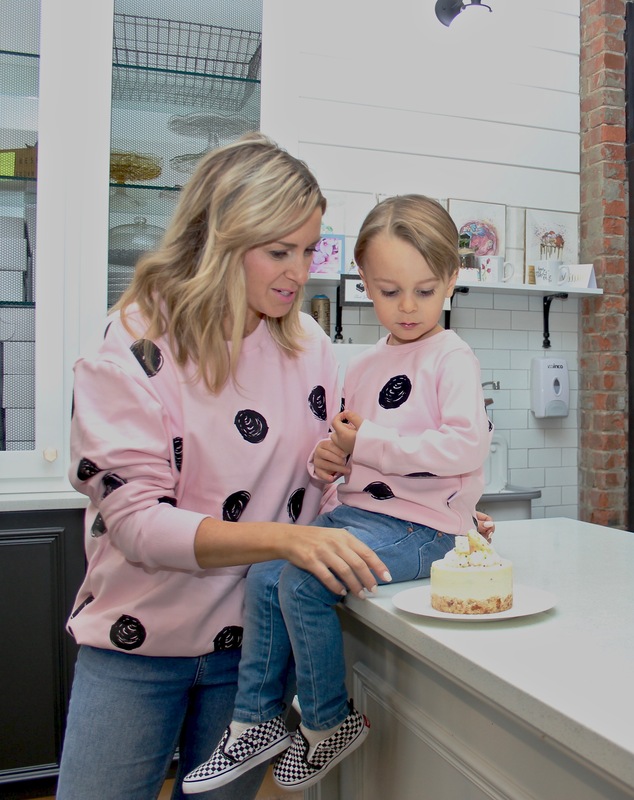 The coziest pink polka dot sweaters and one of the best cakes in the world! Have you fallen for the polka dot trend yet? I’m head over heels! (If you missed my Pretty Polka Dot Floral Wrap DIY, check it out here.) 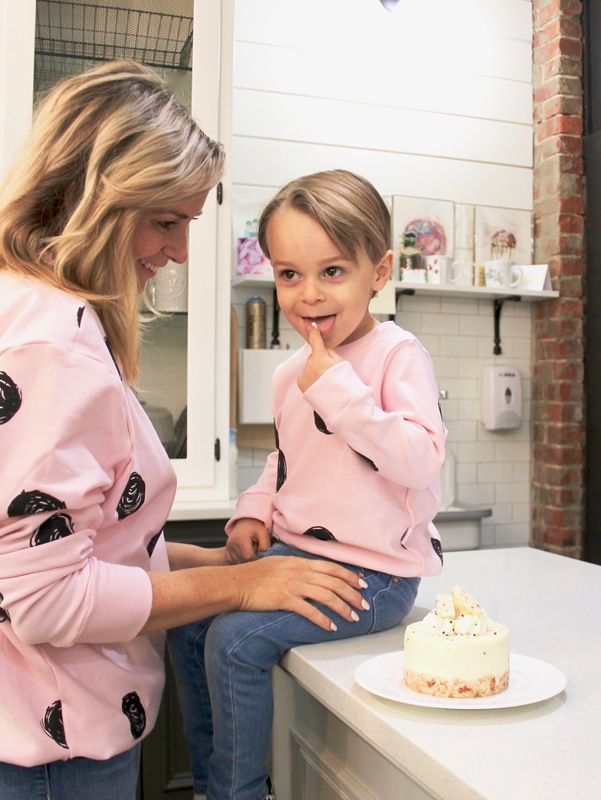 Wyatt and I scored these silky-soft, bamboo fleece polka dot sweaters from Plum Kids – a gender-neutral children’s line (with a few grown-up pieces) designed, handmade and produced St. Albert, Canada. 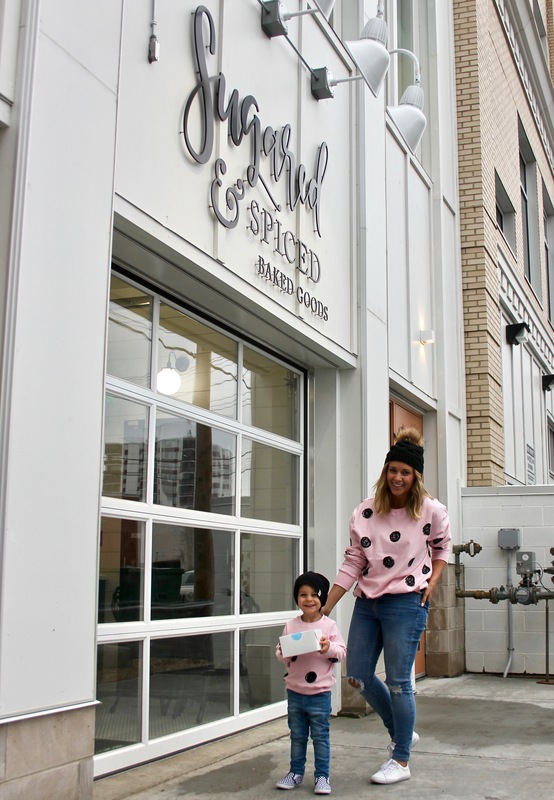 They focus on minimalist styles, and their ‘fabrics are gentle on nature and outsourced in Canada.’ I’m telling you, these sweaters are ridiculously soft! Any chance I can match my mini, I’m taking it! Besides, I know this phase will only last so long, so I’m soaking it up. 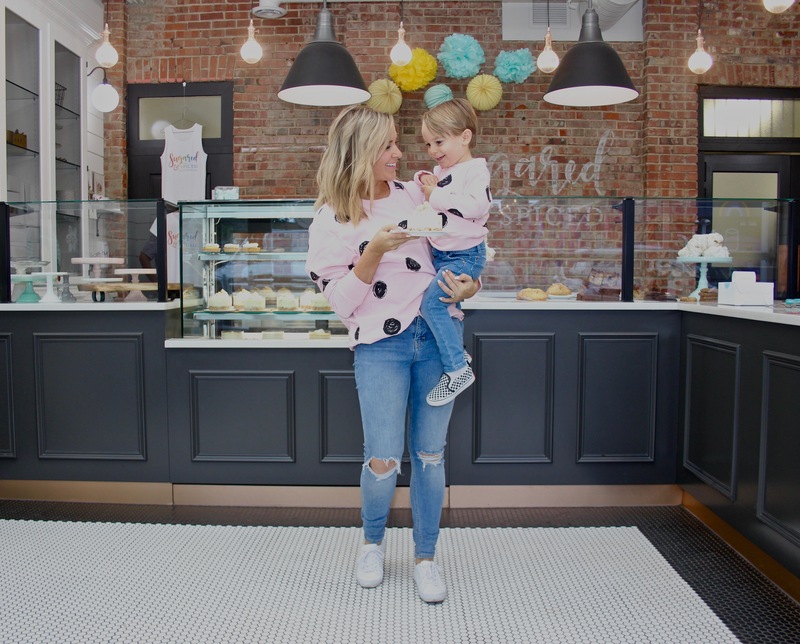 You can check out our Mom + Me Style: Bomber Jackets here. 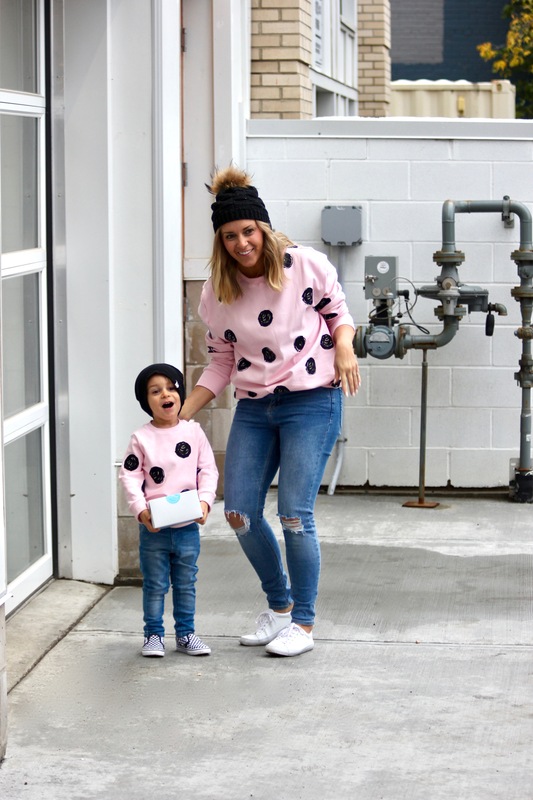 My pink polka dot sweater is one size fits all, and hangs as an oversized sweater should. It’s best paired with leggings or side-tucked into high-waisted jeans. Shop the PlumDot Women’s Sweater here. Wyatt’s sweater is a size 2/3T (he’s three) and fits perfectly, still with a bit of room. Typically, I like to buy his tops one size up for a cooler, more stylish vibe, but in this case, his actual size worked best. Both his and my sweaters also come in a cream colour. 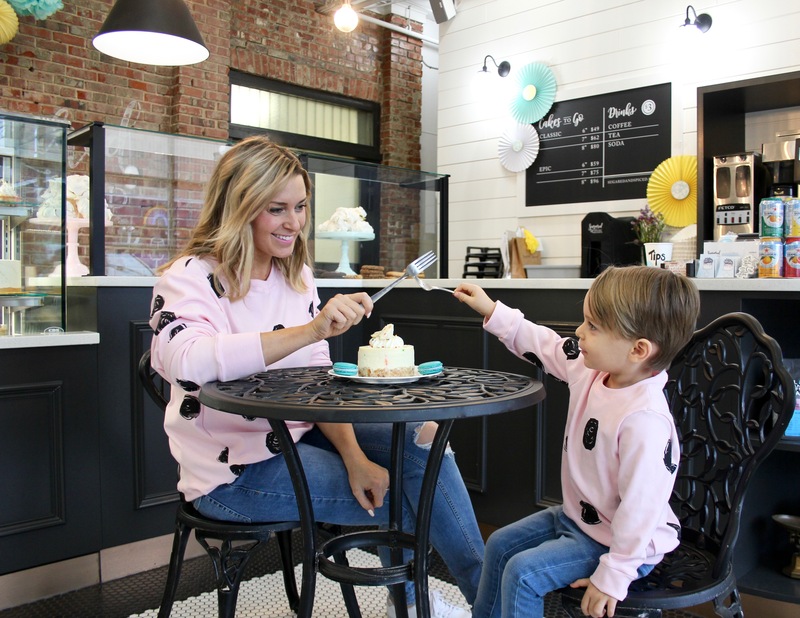 Shop the kids PlumDot sweater here. 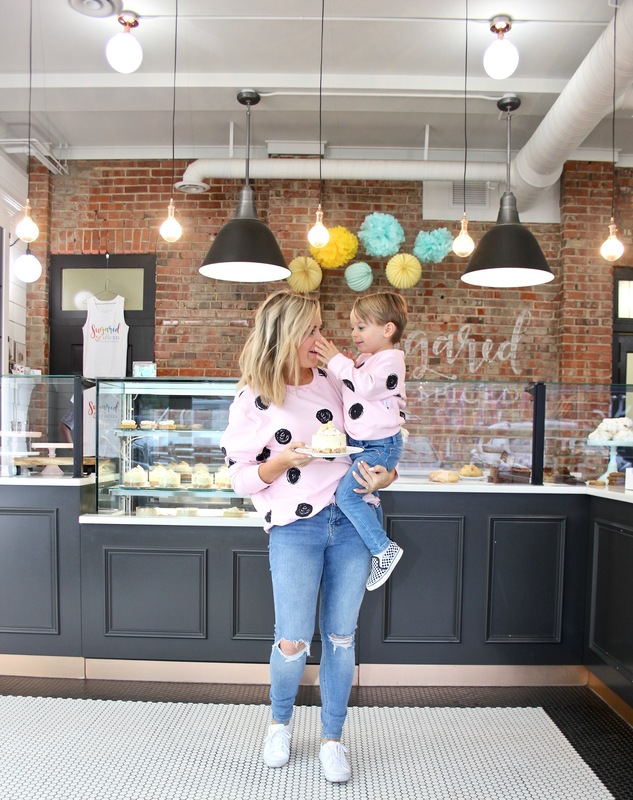 The cotton-candy, sugary vibe of the sweaters were perfect for our mom and son date to Sugared and Spiced, one of our favourite local bake shops. Typically, Wyatt and I go on a date like this once a week and most often the date includes cake! Sugared and Spiced is owned and operated by Amy and Jeff Nachtigall. 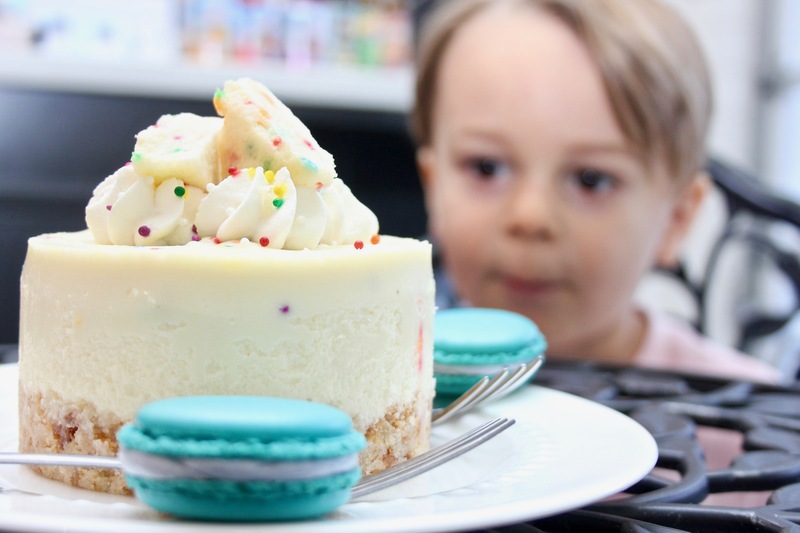 They whip up cakes, cookies, scones, tarts and more. 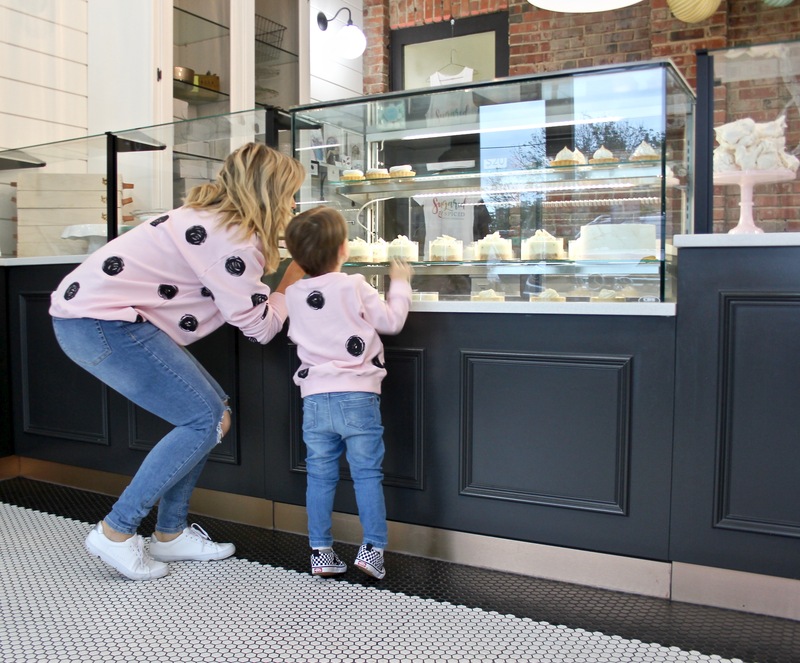 You can custom order, and even join their coveted cake club, where three times a year you get a classic eight-inch cake delivered to your place (within Edmonton city limits), along with 15% off all baked goods all the time! Read up on the cake club here. 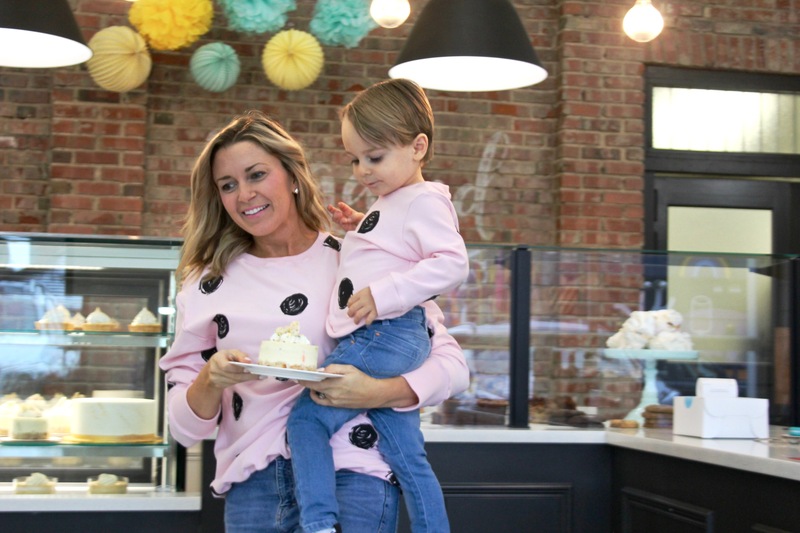 Amy started the business out of their home, and became popular at local markets before they opened up their first brick and mortar shop on Whyte Ave (10334 82 Ave) in September of 2017. You enter the shop through the alley, adding to its uniqueness. The space was designed by Jenna Pryor of Plum Interior Design. I love the exposed brick, copper details, and the massive garage-like doors which open up to an intimate patio in the warmer months. 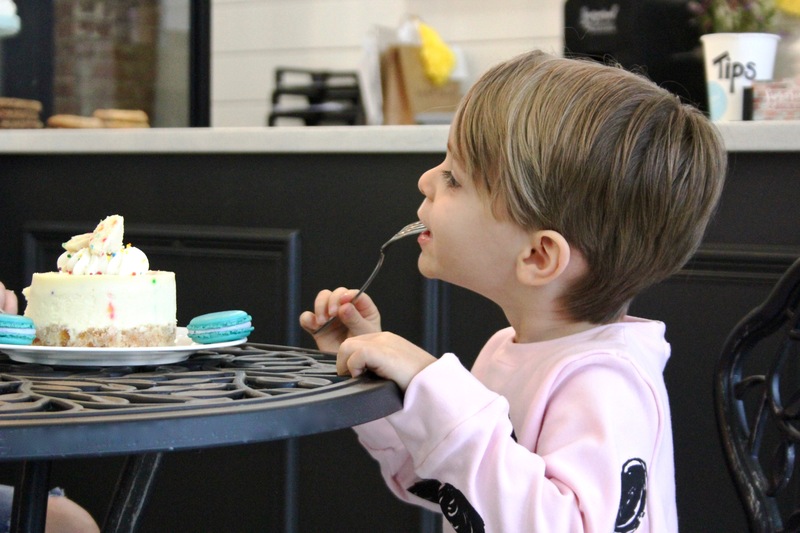 We decided on the birthday cake cheesecake, and Wyatt picked out two macarons in his favourite colour of blue. You guys, I’m not even kidding: this is one of the best cakes I’ve ever had in my life (I take my cakes eating very seriously and have happily sampled hundreds)! This is definitely in my top three. We couldn’t help but take home a few of Sugared and Spiced’s famous scones and, of course, a few cookies. 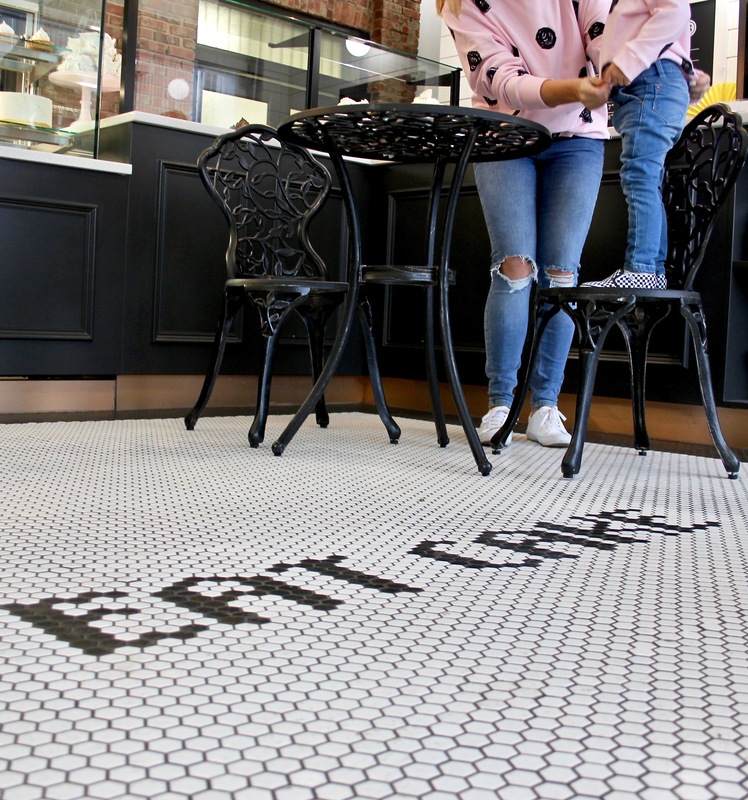 The next time you visit Edmonton, or if you already live here, be sure to pop into this adorable local bake shop! I promise, you’ll be glad you did. Let me know how you like it!